Our Lady of the Lake is a large medical center located in Baton Rouge consisting of a regional medical center, a dedicated children’s hospital, a physician’s group, and two emergency rooms. OLOL manages several large medical facilities, and its Physician Group consists of 450 providers spanning more than 40 specialties. Physicians see 35,000 inpatients and 650,000 outpatients every year. Envoc developed the OLOL Passport app, a mobile app for Children’s Hospital that allows anyone to search for specialists by diagnosis, specialty, or name. Users with very little medical knowledge can easily find a specialist using a detailed search portal and directory and call a hotline to schedule an appointment. OLOL wanted to build a new, more specialized app for internal use, utilizing the existing platform. Envoc’s expertise in mobile and web applications and our developers’ previous work on Passport made the project a perfect fit. While the Passport directory for Children’s Hospital was incredibly effective, the app lacked a single directory from which physicians in the broader Physician Group could find contact information and communicate with one another. Physicians often need to refer their patients to specialists, but the Physician Group with over 450 providers, was not searchable and did not provide easily accessible contact information for other specialists. OLOL wanted a solution much like OLOL Passport but needed it to be designed for specialists with a more technical vocabulary, and access to the portal needed to be restricted so that physicians could contact one another directly instead of through a hotline. With the OLOL Passport as the base, OLOL wanted a new design and more streamlined process. OLOL Passport provides users with three search options: name, specialty, and diagnosis. Since the app was designed for public use, the verbiage is broad, allowing users who do not know the exact medical jargon to find the physician they need much easier. The Passport lists specialties from adolescent care to surgery, very general ideas. Our developers knew that physicians would be more inclined to use the industry jargon. OLOL provided our developers with a list of specialties and the physicians attributed to each to begin building the directory. From there, our developers provided a redesigned platform and a login portal for heightened security. Our developers were then able to extend the existing OLOL Passport content management system (CMS) to manage the new OLOL Exchange with minimal changes, all while maintaining their existing data. 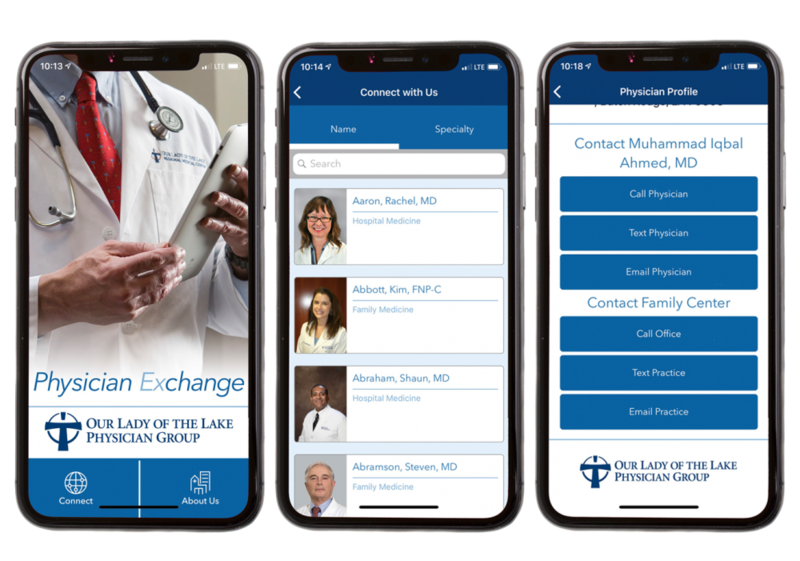 The OLOL Exchange is a Facebook-like directory that provides physicians within the Physician Group with a streamlined platform to find and contact other specialists. Each specialist is given his or her own profile with a picture, short bio, and contact information. Individual physicians can choose to provide direct contact information and/or only list contact information for their practice. Physicians can contact one another by phone, text, or email. Since physicians provide diagnoses and are much more knowledgeable about specialties, the diagnosis option was removed and the specialties were replaced with more specific terminology such as immunology and urology. Any physician in the Physician Group network can be added as a user from the back-office CMS. Both iOS and Android users can download the app and log in using a one-time access code provided by administrators. Additionally, administrators can restrict access, add new physicians to the directory, and keep all information up-to-date. While our developers began with a platform they had already created, OLOL Exchange is a much more complex and powerful mobile app due to its contact functionalities and security features. Our developers didn’t just revamp an existing app; they created a powerful tool to help physicians care for their patients by finding the best person to take over their health.